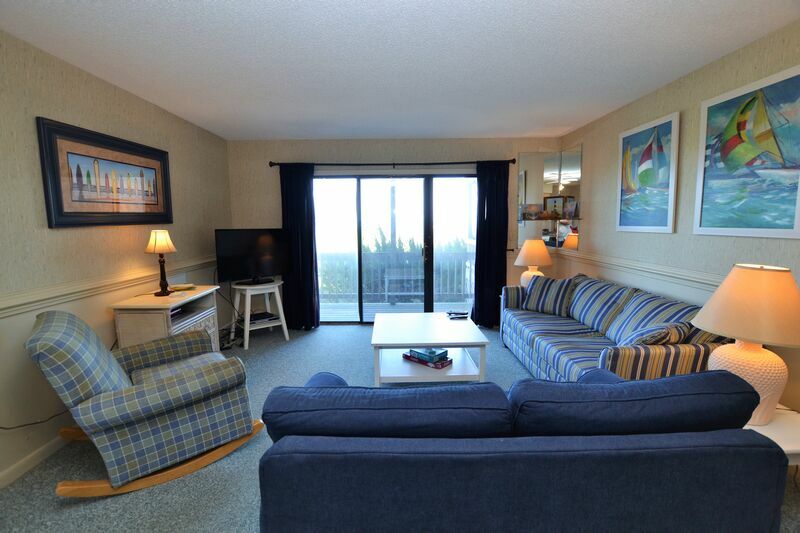 This charming first floor condo in Colony By The Sea offers relaxation and easy access to both the beach and pool. Enjoy all that the town of Duck has to offer with close proximity to lots of shops and restaurants, you can walk or bike through the paved sidewalk to tour the town! Located just south of Corolla, you will be able to take a trip up to see the Wild Horses or the Currituck Lighthouse. This unit is located on the first floor. The Colony by the Sea community pool is open from Memorial Day thru late September. GROUND LEVEL: Parking and Community Amenities. LEVEL 1: Front Deck; Queen Master Bedroom with Flat screen TV; Hall Alcove with Bunk; Full Bath; Living Room with Flat screen TV, DVD and Queen Sleeper Sofa; Kitchen; Dining Area and Florida Room with Double Sleeper Sofa; Oceanfront Deck.